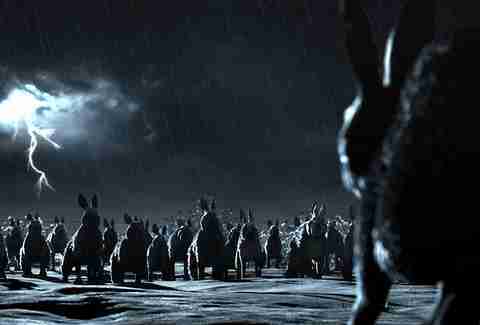 Every 20 years or so, it seems another adaptation of Richard Adams' classic Watership Down arrives. If you know it, you may have read the book for school, or you may have caught the 1999 cartoon miniseries, or, more probably, you may have seen Martin Rosen's beautiful 1978 version, perhaps rented for you by a parent who thought movies with animated animals are always child-appropriate. Anyone with that preconceived notion would have been disabused of it fairly quickly, as the rabbits' home is destroyed and they embark on a perilous journey. Noam Murro, who directed Netflix and BBC's new joint production of Watership Down, is no stranger to ultraviolence, having come directly from 2014's bloody, stylized 300 follow-up 300: Rise of an Empire. 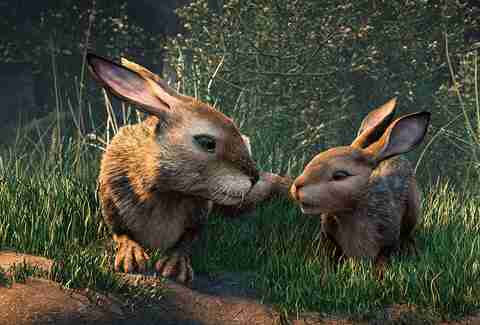 But, he explained to Thrillist, though Watership Down has plenty of unexpected fear and violence mixed in with its deeply allegorical plot, that's part of what makes it so special. Thrillist: How were you approached to adapt this book? Murro: You know, I wasn't aware of the book, actually, as a child. A colleague of mine came to me one day and said, you should make this book. And I read it and I fell in love with it. I started the very long process of getting the rights, I got the rights, and then we started the very long process of adapting it. At first there was talk of making it into a feature film, and very quickly I understood that if you have this kind of depth, you need the platform to have a much deeper investigation, rather than just relegating it into 90 minutes. What made getting the rights to the book so complicated? Murro: The rights owner was Martin Rosen, who made the first film. It was over conversations and many, many, many lunches and plane tickets to be able to really convince him to allow me to take this. He just wanted to make sure, I guess, that it was in the right hands. So, it was just a complicated process of talking about it, making sure that he understands that I understand what this is all about. It's like any other endeavor of that kind. You're dealing with a national treasure, with something that has so much resonance for so many people. It's just always complicated. Was it ever intimidating to develop this story that is so famous and has all these weird esoteric elements and complex politics in it? Murro: When I became friends with Alvin Sargent [screenwriter of Ordinary People], we went once to breakfast, and he said to me, "You know, Noam, what I want on my tombstone?" And I said, "Alvin, what is it?" And he said, "Finally, a plot." It really stuck with me all these years. That idea of a plot: That is the form in which great things are made. So, first and foremost, when I thought about the book, it's that there is the plot. And then, what makes it a fantastic piece of art is that it accomplishes all of these allegorical and social issues, but it doesn't wear all these things on its sleeve -- they're embedded in it, whether they're God, organized religion, migration, the idea of home, loyalty, friendship, environmental issues, our relationship with animals, the relationship of animals with themselves. And even the author Richard Adams had said, this is just a story for my kids, it's nothing more than that. But still, it has all these layers that make it something bigger. Murro: It's funny, because when Mr. Adams was always talking about it -- "It's just a story about rabbits" -- I love that so much, because it's just a humble way of saying, "Look, you put into it whatever you want. But I wrote a story about rabbits." But, always, like great pieces of literature, it's not just about rabbits, is it? One thing I loved about this was all the words in Lapine, the rabbit language from the book, that are incorporated into the show. Sometimes they're not even explained: The characters just use them, and then the scene goes on. Murro: When you have an adaptation of Shakespeare, and even when you think about A Clockwork Orange -- how that language is in it, but it doesn't encumber it. Something like, "For Frith's sake!" is a wonderful thing. There is a use of it in a way that allows you to get deeper into the psyche of these animals, but through the prism of a human being. How did you decide on the very distinct look of the show? Murro: First of all, I think the most important thing is I never wanted that to come between us and the story. Meaning, the animation should service the story, and not vice versa. So, that was the first rule. And the second thing that happened was I was in the Natural History Museum in New York, and I was wandering around, and somehow ended up in the diorama room. Oh, I love that room. Murro: It's amazing. And I looked around, and I said, "Oh, my God. This is Watership Down." When you look at the show, that was the intention. These are the "painted backdrops," and they give you the exact emotional connection to the place, and as you get closer to the camera, it becomes more real. And some of the rabbits, especially Fiver and Bigwig, get so expressive. They look like people almost. Murro: Yes, but without anthropomorphizing. Without making them feel cute or too much like -- it's still a rabbit. And that is a fine line that we have to walk. It's not about making cute animals, or human-like animals, or anything like that. It's about making them so that there is a way to relate to them. I love watching nature documentaries, and I especially love the ones that don't try to make animals have human emotions or reasons for doing stuff. They're animals, they do stuff because they need to. And this story has violence, it has complicated things in it. It's barely a kids' story, really. Murro: I think Maurice Sendak used to say, "There are no children's books. There are good books and bad books." I thought of [Watership Down] as a story, first and foremost. And in that story are elements of violence, because they exist in nature, they exist in our lives. It's not trying to be gory, it's not trying to frighten you. Because that was never the intention of the book, I don't believe, to make you hide behind the couch. The idea is to have violence be part of its DNA, because that is part of the narrative, and part of the emotional arc that these characters are going through. You have actors like John Boyega, Ben Kingsley, James McAvoy providing the voices for this. The cast for this is amazing. How did you get all these people to be in it? Murro: I am a very lucky man. [Laughs] I don't think I'll get to do that again. This is nothing without them. And their understanding of the material on a psychological, philosophical, literary point of view is astonishing. It is a seminal cultural piece, especially in England, and that's what brought a lot of these incredible artists to it. When we were sitting down in the early stages, and going, gee, imagine if James McAvoy would be willing to play in it…. Cut to however long after, he gets the first draft of the first episode, and he opens the door to get the draft, and he's wearing his old Watership Down T-shirt. Talk about karma, right? I mean, literally out of the blue. That's how he opens the door. And he sent us a picture of him standing there with the script in the mirror, and he said, "If this is not a sign, then what is?" Do you think that this is a story that is appealing to people even now, so long after it was written? Murro: Turn on any TV channel you want today, in any country, and you'll understand why this story is so relevant today. Migration, environment, friendship, home nationality, -- you name it. I think this will always be a relevant story. Maybe today more than ever. It sources itself from history -- World War II, post-war issues, you can see the parallels there -- and somehow relates to what we are today. It's always going to be timely. 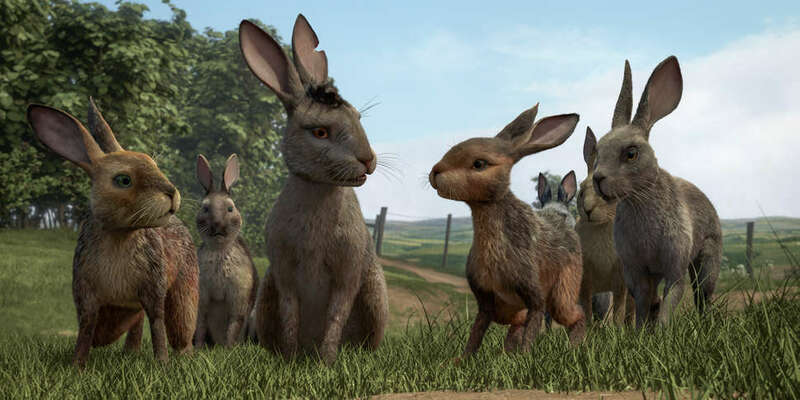 Though it's huge across the pond, there are plenty of Americans tuning in to this series who may have never heard of Watership Down. How would you describe this to someone who had no idea what it is? Murro: It's just such a deep and wonderful and sensitive story about our cyclical and existential life, I think. Just, instead of people, it uses rabbits. If I had to put it in one continuous thought, that would be it.